The addition of applesauce is a nice change up from the typical pancake batter. These are kid tested and mother approved! Preheat: Heat griddle as per instructions or if using a large skillet heat over medium to medium-high heat. Meanwhile, preheat oven to 200 degrees F, and place a baking sheet on the middle rack while oven is heating. Prepare: In a large mixing bowl, add flour, sugar, baking powder, cinnamon, nutmeg and salt, mix well. Next, add in the applesauce, non-dairy milk and vanilla extract, mix until just combined, do not over mix. Your mixture may seem to swell up a bit due to the baking powder, this is normal. Clean and quarter an apple, remove the core. Cut into thin slices about 1/8 – 1/4 inch. Cook: Place 1 teaspoon of oil on the griddle/skillet and spread evenly over the cooking area (I use a silicon brush). Place 2 apple slices on griddle, side by side, where pancake batter is going to cook. Using a 1/4 cup measuring cup, scoop batter and place on top of apple slices. Cook until bubbles form on the top and edges start to look leathery, about 2 1/2 – 3 minutes per side. Flip pancakes, cook another 2 – 3 minutes. Repeat until batter is gone. Keep Warm: As pancakes finish, place them in the oven on the warm cookie sheet to keep warm until all pancakes are ready. Serve with pure maple syrup. A few fresh apple slices would also be great to serve. Store leftover pancakes in an airtight container in the refrigerator for up to a week, or freeze for up to 2 months. 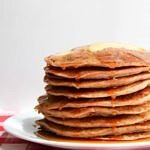 Reheat your pancakes using one of these methods from eHow. Make a vegan buttermilk by adding a teaspoon of apple cider vinegar or juice of 1/2 small lemon to the milk 10 minutes before using. I used Fuji apples here. Crisp and sweet, they are my favorite. Use your favorite apple. Vary up your spices with cardamom, allspice or cloves in place of the nutmeg. For maximum fluffiness, once you place the batter on the griddle, do not flatten out the top to try to spread the pancake unless you’re adding apple slices underneath. I learned this from experience, my pancakes weren’t bad but just not as fluffy as they could’ve been. For thicker pancakes use less milk, for thinner use more.